Simon & Schuster, 9780743269988, 323pp. In 1999, when Napster made music available free online, the music industry found itself in a fight for its life. A decade later, the most important and misunderstood story--and the one with the greatest implications for both music lovers and media companies--is how the music industry has failed to remake itself. 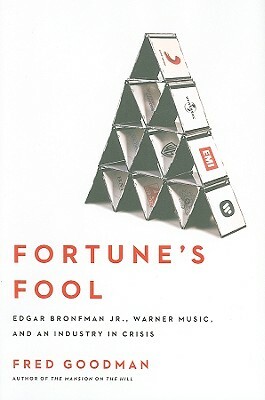 In Fortune's Fool, Fred Goodman, the author of The Mansion on the Hill, shows how this happened by presenting the singular history of Edgar M. Bronfman Jr., the controversial heir to Seagram's, who, after dismantling his family's empire and fortune, made a high-stakes gamble to remake both the music industry and his own reputation. Napster had successfully blown the industry off its commercial foundations because all that the old school label heads knew how to do was record and market hits. So when Bronfman took over the Warner Music Group in 2004, his challenge was to create a new kind of record executive. Goodman finds the source of the crisis in the dissolution of the old Warner Music Group, the brilliant conglomerate of Atlantic, Elektra, and Warner Bros. Records. He shows how Doug Morris, the head of Atlantic Records, rose through the ranks and rode the CD bonanza of the 1990s to enormous corporate and personal profit before becoming embroiled in an ego-driven corporate turf war, and how all of Warner's record executives were blindsided when AOL/Time-Warner announced in 2003 that it wanted nothing more to do with the record industry. When the music group was finally sold to Bronfman, it was a ghost of itself. Bronfman built an aggressive, streamlined team headed by Lyor Cohen, whose relentless ambition and discipline had helped build Def Jam Records. They instituted a series of daring initiatives intended to give customers legitimate online music choices and took market share from Warner's competitors. But despite these efforts, illegal downloads still outnumber legitimate ones 19-1. Most of the talk of a new world of music and media has proven empty; despite the success of iTunes, even wildly popular sites like YouTube and MySpace have not found a way to make money with music. Instead, Warner and the other labels are diversifying and forcing young artists to give them a cut of their income from touring, publishing, and merchandising. Meanwhile, the average downloader isn't even meeting forward-thinking musicians halfway. Each time a young band finds a following through music websites, it's a unique story; no formula has emerged. If one does, Warner is probably in a better position than anyone to exploit it. But at the end of the day, If is the one-word verdict on Bronfman's big bet. "Fortune's Fool is a worthy follow-up to Goodman's classic, The Mansion on the Hill, and confirms his reputation as one of the most incisive observers of the music business." "The compellingly told story of the Seagram heir’s music-business adventures at Universal and Warner Music, and what went terribly wrong....Deftly balanced and well-sourced—one of the most solid music-biz bios in recent memory." "An insider's perspective on an industry in flux."